Kitty Keswick has been an Anglophile since age four when she saw Robin Hood and fell head over heels in love. As she grew up on her grandfather’s California vineyard, Kitty’s imagination was her best friend. At a very tender age, she started writing her stories and reading them to the grapes. Here is a description of Kewick's newest novel, Freaksville, which will be available on January 8, 2010. Every woman in the Maxwell family has the gift of sight. A talent sixteen-year-old Kasey would gladly give up. All she wants is a normal life. Shopping and talking about boys with her best friend and long-time sidekick, Gillie Godshall, consume her days. Until Kasey has a vision about Josh Johnstone, the foreign exchange student from England. The vision leads her into new realms, a lead in a play, a haunted theater ... and into the arms of Josh. Yet, both Kasey and Josh have secrets lurking in dark corners. Can Kasey’s new romance survive FREAKSVILLE? Kitty: I think I was born with a pen in hand. I’ve always written. I’ve just taken a few detours along the way. I started writing in high school and, when I went to college, my first major was Journalism. Then I switched to television and theater, and once again switched to Interior Design…er, not a great pattern. LOL. Kitty: It’s not the writing that takes the time; it’s the tweaking, the fine-tuning. Freaksville spewed forth rather quickly. But I went through a couple of rewrites making sure every detail was perfect. I did threaten bodily harm to my computer many times, but somehow it—and I—made it through. Kitty: My Post-It note fetish. But I’m not sure it’s interesting. Whenever I’m writing a story, by the end of the process, I have a ton of multi-colored squares covering the walls that surround my computer. They keep me on track and help make sure I don’t have any plot holes. Kitty: Er, Post-It notes? Let’s hope there isn’t a sudden category 5 hurricane in my office. Otherwise, I’m in trouble. LOL. But fret not. I also keep notebooks, note cards and binders full of information as well as the novel in my head. I often go back to edit and write the exact same sentence I wrote a couple of lines below. I almost memorize my novels, but not on purpose. I see them like movies and everything sticks. Kitty: Memorize this: READ, WRITE, READ. By reading other’s work, your own writing will improve. You can learn a lot about story pacing, plot, conflict, and so much more just by reading. Kitty: Conflict, without it a story is boring. It’s the conflict that keeps us turning the pages, gnawing our nails, reading until the wee hours. Conflict can come from other characters, nature, or from within the heroine or hero. Kitty: I love YA and have a few more stories rattling around in my head. So, for now, I’m sticking with that. I prefer the paranormal genre, but I‘m not opposed to trying something different. The stories and characters lead me. Hope you guys enjoyed reading about Kitty Keswick! 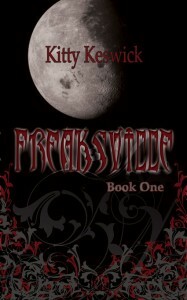 Be sure to check out her new book Freaksville and her other novels. For more information, visit 2K10's website.